We’ve used the term ‘low-key’ to describe Ad Hoc’s David Gonzalez before. 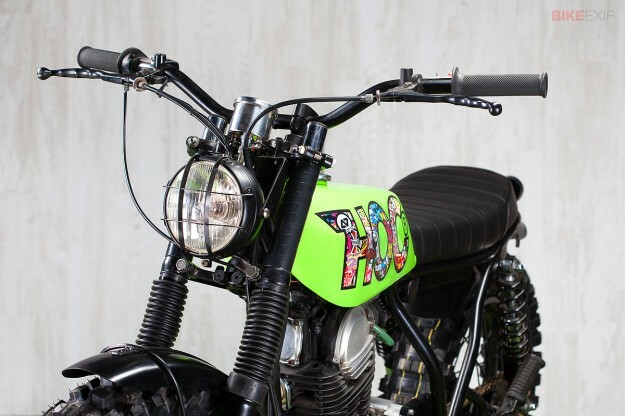 His latest release—an audacious Yamaha SR250—is anything but. 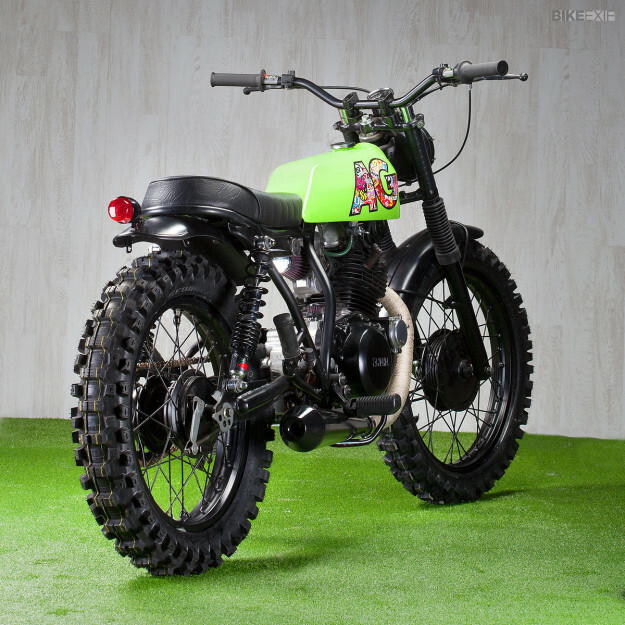 This cheeky-looking scrambler was built to appeal to the urban and extreme sports sensibilities of its young owner. “The first thing that came to mind was to make a motorcycle ‘thug,'” David says of their initial meeting. So, from the Ad Hoc workshop in the peaceful hills just outside Barcelona, he set to work—starting by adapting the fuel tank from a Derbi Coppa, a motorcycle that was very popular in Spain in the 70s and 80s. 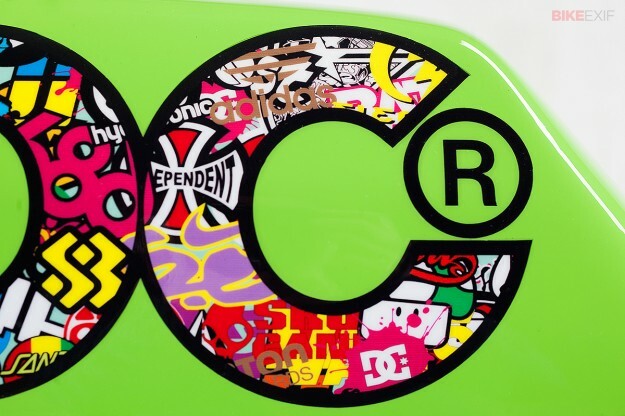 Accompanying the tank’s bright green paint is an oversized adaptation of Ad Hoc’s logo, with ‘Ad’ replaced by the client’s initials—’AG.’ Made up of a collage of some of his favorite skate, snowboard and apparel brands, it was laser printed onto vinyl before being applied to the tank and coated with a clear lacquer. The next step was to de-tab the frame and weld in a new rear hoop. Once that was done, all the wiring was re-routed to run inside the frame, with a new Lithium-ion battery positioned under the swingarm. A custom-made leatherette seat was installed and the area underneath it completely cleaned up, with the exception of a discreet tray to house the remaining electronics. The entire frame was then sandblasted and powder coated. 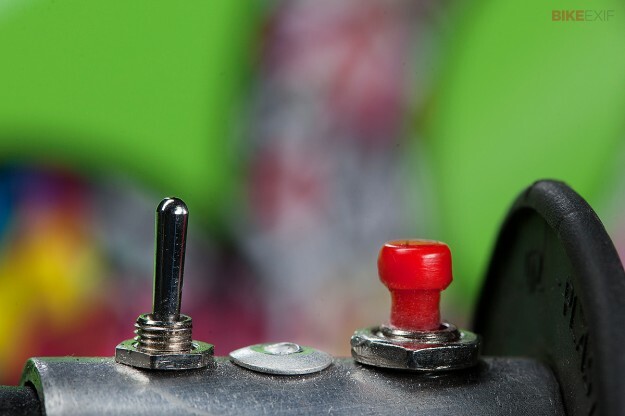 Renthal’s ‘Low’ handlebars were fitted, with hand-made mini switches replacing the stock switchgear and all the wiring relocated to inside the bars. Ad Hoc left the 1989-model engine untouched, merely giving the carb some attention and installing a K&N filter and engine breather, along with a blacked-out reverse cone muffler. Both the front and rear stock fenders were trimmed—the front receiving a handcrafted brace, “to give it a more classic look.” The stock drum brakes were also retained, but the rear shocks were swapped out for longer units for a slightly higher stance. Dunlop’s Geomax tyres are the perfect choice to suit the SR’s scrambler motif, as is the headlight—taken from an excavator. 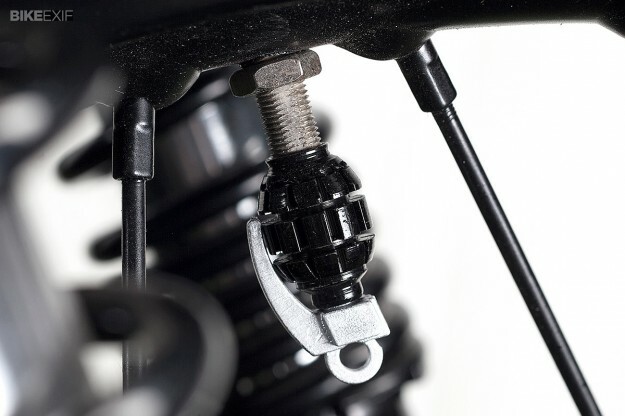 Hand-grenade valve caps add an additional playful touch. 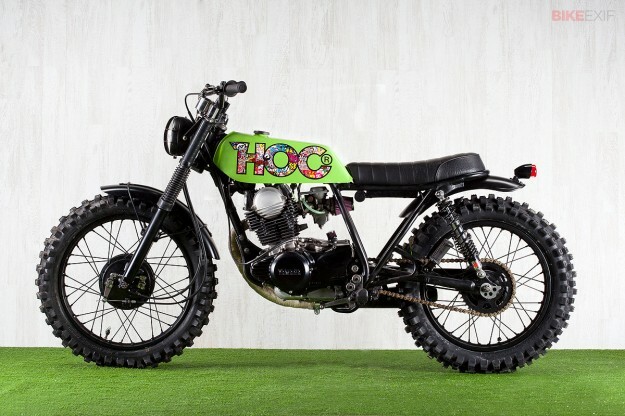 At a time when monochrome and understated seem to be à la mode, Ad Hoc have succeeded in building a motorcycle that’s a little irreverent, a lot of fun, and not the least bit gaudy. I’m probably nowhere as hip as its owner—but I’d ride it. Would you? Images by Monica Doallo. Check out the Ad Hoc website and Facebook page to see more of David Gonzalez’ work.